Who, except two crazy old guys—skipper Tony Smith was 71 and I was 68—would trail a 28ft trimaran 7,000 miles across America to go sailing for a few days among icebergs, breaching whales, soaring eagles and those pesky grizzlies? Our long-planned, once-in-a-lifetime adventure to the untamed shores of Alaska promised risks and danger. “It’ll thrill you or kill you,” warned one naysayer. “The boat is whale and bear-proof!” promised Tony. But you’re never too old to take one last life-affirming risk, whether it’s a Gray Gap Year or a spot of wilderness cruising. We didn’t feel a tremor from one of the numerous earthquakes that strike this region, but you don’t have to venture far into Alaska’s vast wilderness to find creatures with claws and big teeth, or discover you’re sharing the sea with 100ft-long 40-ton giants. In October of 2014, Tony—who’s best known for his many years of producing the popular Gemini catamaran—and his wife, Sue, trailered Telstar, his 28ft trimaran, the first 3,000 miles from their home in Annapolis, Maryland, to Bellingham, Washington, where the boat spent the winter on the hard before embarking on a three-day car/boat ferry trip north in early summer 2015 on Alaska’s Marine Highway to Haines, where she was finally launched. A few days later I met up with Tony 90 miles south, in Juneau, Alaska. After 24 hours locked in transit, flying from London via Seattle, the stillness of Auke Bay Harbor was balm to the soul. The epic grandeur of the landscape dwarfed everything, and the stress from travel fell away like a molting skin. Southeast Alaska may have 33 towns or communities, but only three have access by road. Even Juneau, the state capital, can be only reached by air or sea. No gridlock here. In the summer the sun barely sets in Alaska. It just dips low in the sky and comes right back up again. We set off at dawn in the shadow of snow-capped Mount McGinnis. It was mid-June and the longest day, the day after our departure, would be 18 hours 36 minutes. In flat calm waters, our 50hp Honda outboard engine sped us toward our first destination 60 miles away, Hoonah village, home of the native Tlingit clan. In less than two hours we had the first of many whale encounters when what looked like a glistening black rock transformed into a living leviathan. Its breath, a cloud of water vapor, hung in the air like smoke as it exhaled. Then it slapped its huge scythe-like black fluke on the water and vanished, leaving a dark shadow and a few ripples. A mile from Hoonah we approached Icy Strait Point, which hosts Alaska’s largest summer population of humpback whales. Cruise ship visitors are reputedly offered a $100 refund ($50 for children) if they don’t spot a whale. We saw several. Passing’s Hoonah’s cemetery on Pitt Island, with its crosses and totems, we moored up astern of a beautiful 98-year-old classic wooden ketch, Skoiern, with French liveaboard owners Patrick Chambier, his wife Anne Marie and their ship’s cat, Zoe. This delightful couple in their 60s sailed from Brittany seven years ago, via the Panama Canal, and plan to return to Europe via Cape Horn. At the time ofthis writing, they’re in Chile. 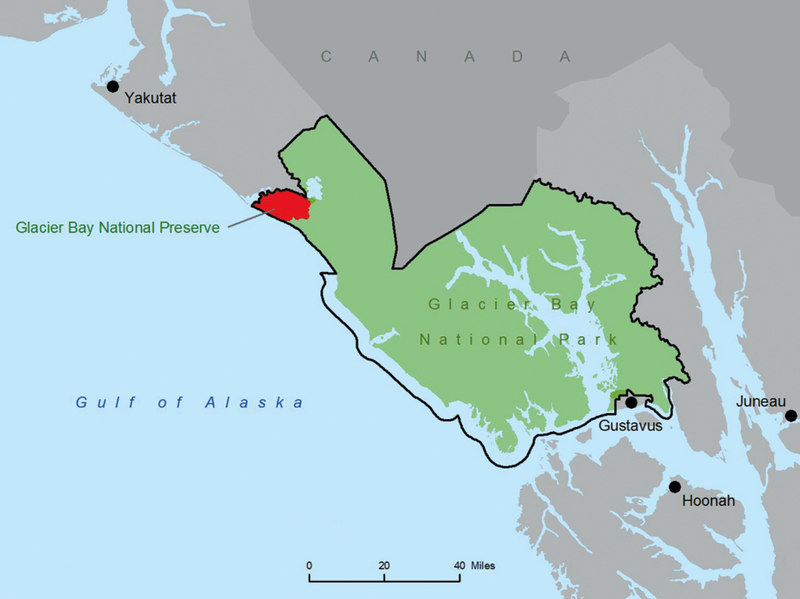 Tucked into the north-east corner of Chichagof Island, Hoonah is the largest Tlingit village in Alaska. 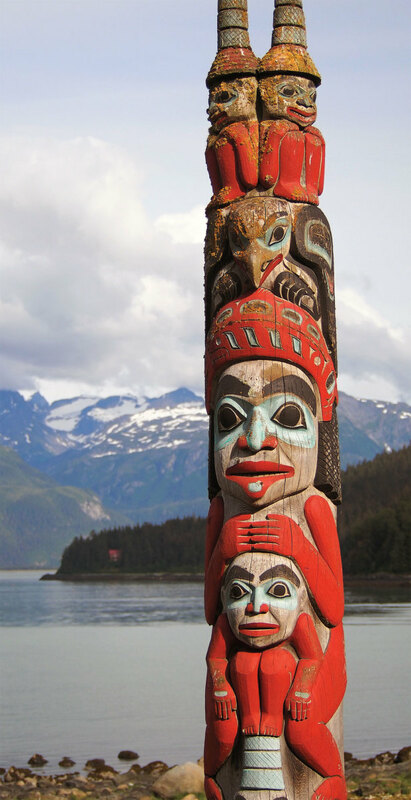 Most of its 850 residents can lay claim to native heritage, and in a workshop, in town, we found folks busy carving totem poles and decorations for a Tribal House being built in Bartlett Cove, site of the National Park Service Headquarters in Glacier Bay. In summer, Hoonah’s population swells to around 1,300 with tourism, fishing, hunting and hiking, but the village can only be reached from the mainland by sea or air, and in the winter its local roads are inaccessible with deep snow. But even Hoonah has a waterfront Chinese restaurant, Mary’s, where we dined that evening. Next morning, with hardly enough wind to ruffle a bald eagle’s feathers, Mr. Honda was fired up as we headed west for the coastal village of Pelican 65 miles away. A verdant, uninhabited coastline of brush and trees slipped past, seemingly untouched since the first humans set foot here. Yet not so long ago, this same landscape was buried under hundreds of feet of ice, even in summer. When George Vancouver sailed these waters in 1794, Icy Strait was choked “with mountains of ice.” Just 80 years later another explorer found the ice had retreated 50 miles up the bay. Over the next three hours, a school of dolphins, a host of otters, several whales, and a solitary inquisitive sea lion, with whom I could have shaken flippers, all managed to evade my best attempts at wildlife photography. We caught the ebb tide through South Inian Pass, a narrow passage where the glassy calm turned to tide rips and mini whirlpools. This is the gateway for humpback whales arriving from their breeding grounds in Hawaii, and we passed a mini flotilla of whale-watching boats. In Cross Sound, at the north end of the Inside Passage and on the edge of the Pacific Ocean, we turned south down Lisianski Inlet, a long, narrow fjord surrounded on both sides by fir tree-clad mountains still wearing their snow caps. I gazed at the long ridges and wondered when and who, if anyone, had last climbed here. Our late afternoon arrival in Pelican coincided with “rush hour,” as a couple of float planes and a ferry docked. The town’s year-round population of less than 130 grew as a bunch of Canadian fathers and sons stepped ashore for a Fathers’ Day fishing adventure. Pelican’s quirky community is built on pilings. Main Street is a long boardwalk, and city hall is a tin-roofed shack. The once prosperous cannery at the end of the dock stands derelict, and a tsunami escape route sign on a dirt track points to higher ground—a salutary reminder that Pelican was on the fringes of the 1958 Lituya Bay tsunami that rose to 1,700ft in places. Pelican was lucky and got off lightly. That evening we dined at Rose’s Bar and Grill, which, though lacking swing doors, had a Wild West atmosphere with its long saloon bar, stools, piano and autographed ceiling. A local wore a Rose’s Bar hoodie bearing the slogan: “Take Your Pants Off, Let’s Have a Party!” Lucky for us it wasn’t party night. Distances in Alaska are daunting. We’d hoped to go south to Sitka, but we didn’t have a forecast of reliable winds or the range in our fuel tanks to get everywhere we planned. Instead, next morning we made a short hop north to picturesque Elfin Cove, where a pair of whales cavorted in the bay. We followed a bright yellow floatplane that landed ahead of us and taxied to the dock. Like Pelican, Elfin Cove has no roads and is built around a network of boardwalks, stairs and ramps linking homes and offering views over a protected inner lagoon. Ashore, over a coffee in Cohos Bar and Grill, owner Shirley Perkins told us how lucky we were. “Last year we had 13 days of sun,” she said. “The only thing you can count on is no snow at this time of year!” But, she said, they get 100 inches of rain a year. In July and August, Elfin Cove is a paradise for fishing charters and sightseers, but in winter it’s a ghost town with a population of a dozen or so. The village school closed when pupil numbers dropped below 10, and it’s now a museum. The floatplane service reduces from three times a day to once a week, weather permitting. Elfin Cove was an unexpected gem, and I would have loved to have lingered longer, but we had a flood tide to catch through Indian Narrows for our visit to Glacier Bay National Park, where our prized free four-day permit awaited. We cast off, spellbound by the sight of Brady Glacier rising out of the sea to the north, and merging with white clouds and blue skies in a surreal, almost illusory, montage. In sunshine and 70-degree temperatures we hoisted sail with a perfect breeze. 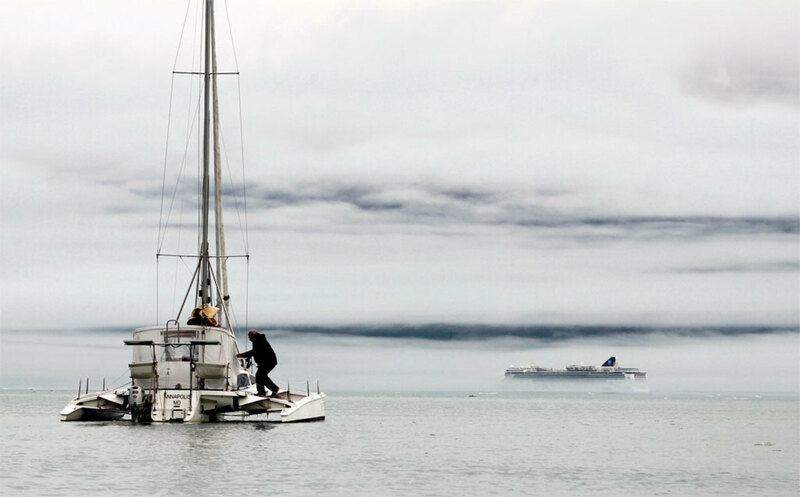 Multihulls are renowned for gunkholing, but in Alaska, we floated in unfathomable depths. Even the echo-sounder blinked and gave up. Tony’s home cruising ground in Chesapeake Bay has an average depth of 21ft. But Glacier Bay’s deepest point is 1,410ft, so it was no surprise that we called in at the Hoonah Trading Company to buy an extra 200m of rope and extra anchor chain. In Glacier Bay’s vast emptiness—roughly the size of Connecticut—there are no settlements, let alone mooring buoys. Only 25 private vessels a day are allowed in the National Park, a World Heritage Site, plus two cruise ships and nine charter vessels. As we passed Point Gustavus next day, we felt the drop in temperature. Humpback whales spouted and waved their tails as we headed for Bartlett Cove dock to collect our permit and attend the mandatory orientation talk. We learned which areas were off-limits (due to breeding wildlife), how to steer around whales (stay one mile offshore) avoid landslides (which create big waves) and be aware of 25ft tidal fluctuations. Then we set off into the icy unknown. Just 250 years ago Glacier Bay was all glacier and no bay. Now the 100-mile-long river of ice, thousands of feet deep, has retreated to very the top of the bay. The farther north we headed the more the temperatures dropped, with low cloud and mist clinging to the shoreline. Two killer whales frolicked in the entrance to Blue Mouse Cove, where we anchored in 40ft as close to shore as we dared. By now we were getting blasé about whale sightings. While Tony cooked supper, I took the inflatable dinghy ashore, heeding the pilot book’s warning: “You may often sight wolves and bears along the shoreline.” Solitude and stillness prevailed. Only once before, in Mexico’s Sea of Cortez, have I felt so far from civilization. Step a few yards ashore into the brush, and you’re probably standing where no human has been for decades, or forever. The pilot book said this was a “popular anchorage,” but there were just two other boats half a mile away. Waking up at 0500 to a gray, overcast day, we set off for Lamplugh Glacier, 20 miles north, after a quick breakfast before the weather closed in. Otters drifted past lying on their backs, as if sunbathing, while Tony, snuggly zipped up inside the cockpit tent, enjoyed the benefits of his own private “greenhouse” effect. An hour later a large, uncharted gray rock covered in gulls slid past to starboard. Twenty minutes after that there was a loud bang as a sizeable chunk of ice bounced off the port outrigger. Unzipping the cockpit cocoon, we saw lots of mini-bergs. This was a good place to fill the ice chest, except we had no gin or tonic. That’s when we realized the gray rock somewhere astern was a dirty iceberg the size of an SUV. By now the temperature had dropped to 40 degrees as we approached John Hopkins Inlet with its six glaciers—Lamplugh, Reid, Hoonah, Gilman, John Hopkins and Topeka. Amazingly, there are 1,045 glaciers in the park, but only 50 are named. We turned a corner and there in serene splendor was Lamplugh Glacier, a panoramic wall of ice crowned by jagged pinnacles shimmering sapphire blue in the reflected morning light. I launched the tender and rowed away with my cameras to capture Tony and Telstar against this breathtaking backdrop. The phrase “deafening silence” took on a new meaning with the sheer scale and wonderment of pristine nature. It felt so alien I half expected to see Planet Earth spinning like a blue marble above. A rumble and a splash as a large chunk of ice broke away from the glacier’s snout 100 yards away warned me not to get too close. Ten minutes later the magic spell was broken as a five-story “office block” appeared out of the mist. The Grand Princess, a 1,000ft cruise ship, glided into view, and I could almost hear a fusillade of camera shutters clicking from passengers lining the triple decks. Tony reckoned we ruined their photographs. I reckon we put things into perspective. Against the majesty of this cinemascope scenery even the Grand Princess was reduced to a pea-sized child’s toy. When the ship disappeared around the headland, we re-claimed our solitary isolation, though later we jealously imagined the passengers enjoying fillet steak with a nice Cabernet Sauvignon as we tucked into cheese sandwiches. Motoring farther south, we could hear and smell the huge colony of Steller sea lions on South Marble island long before we got close. But our stay in Glacier Bay was to be cut short by a change in weather. Our final passage, back to Haines, took us up the Lynn Canal, one of the deepest, longest fjords in the world, its waters turned milky white in places by glacial runoff. During the Klondike Gold Rush, the canal was a major route to the boomtown of Skagway, at its head. Not for nothing did Skagway’s native Indians call their town “Home of the North Wind.” Tony’s concerns at being weatherbound up the narrow Taiya Inlet saw me catching the fast ferry from Haines to Skagway—it’s 350 miles by road, around the mountains, but just 45 minutes by ferry! Even the waves of tourists from cruise ships in town couldn’t overwhelm Skagway’s ghosts and its sense of history. Fascinating. The only gold we struck were the sunrays on our last day afloat in The Last Frontier. We’d covered over 500 miles and our fortune lay in luck with the weather and wildlife. It was time to hook up the trailer for the long drive home. This was the ultimate road trip. 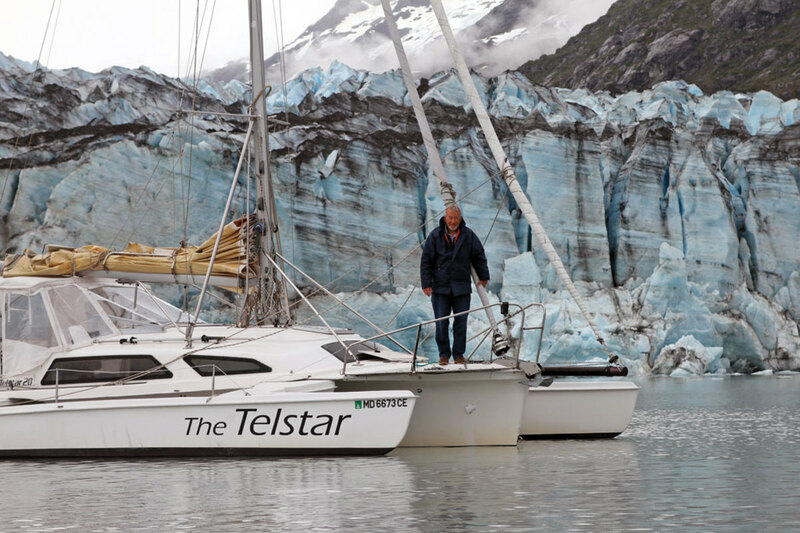 Trailering Telstar 4,000 miles from Alaska back home to Annapolis was like crossing an ocean. Big horizons, empty spaces and, for the first 1,100 miles down the Alaska highway, only the occasional passing “ship.” Our “cruising average” of 500 miles a day, compared to the 70 we’d covered afloat, got us across the country in eight days. Tony’s GMC Savana van was converted to all wheel drive specifically for the trip. Our LOA was 53ft, including the mast overhang, with a beam of 8ft 6ins, the legal limit in most states without an extra wide permit. We drove through four time zones and crossed 15 states—not including, fatigue, and anxiety! It took six hours to drive a hand&apos;s width across the road atlas. For those who like stats, we drove for about 94 hours in total, taking shifts, and averaged about 7.7 mpg. Our scariest moment? Two tire blow-outs on days seven and eight. As we set off from Haines, Alaska, Tony told me he’d “capsized” two Telstars in the 1970s while towing them in Britain and France. “Trailers are more sophisticated these days,” he reassured me. We left Haines at dawn on our epic drive, the edge of the highway marked by poles. They had 360 inches of snow here during the 2011−12 season. In less than an hour, we had crossed the Canadian border into British Columbia. I counted six cars in 100 miles. We stopped to check the trailer and tires before crossing into the Yukon territory and passing through Whitehorse, the state capitol. There’s a camaraderie on the Alaskan Highway and truck stops are like anchorages, as fellow travelers stop to share tips and tales. We stopped for brunch at Kathy’s Kitchen, beside Watson Lake and met oil workers and bikers. Apart from bison and moose on the highway, there are herds of leather-clad bikers—intrepid men (and women) we met from Wyoming, Texas, Denver, New Mexico, and as far away as Boston, New Zealand and the UK. Many bound for the Far North—Prudhoe Bay and Deadhorse���covering 600 miles a day, just for the hell of it. It’s a “journey, not the destination” sort of thing. The road stretched ahead in an endless, enthralling vista. After two days and two nights on the twisting ribbon of tarmac, with stopovers at Teslin, Yukon, and Fort Nelson, BC, we completed the first 1,150 miles, reaching Mile Zero of the Alaska Highway at Dawson Creek, BC. Our route meandered through fir-tree forests, alongside burbling creeks, past the emerald, glacial waters of Muncho Lake and the majestic Rocky Mountains. The Trans-Canada highway, the longest highway in the world, took us through rolling wheatfields as far as the eye could see, and towns like Mozart and abandoned Insinger, a ghost town with an exotic onion-domed Ukrainian church. On we drove, across Manitoba to the outskirts of Winnipeg before turning south to get a room at the last motel in Canada, en-route on to the U.S. border. After refuel stop in Fargo, North Dakota, we headed on through Minnesota and Wisconsin feeling we were on the home stretch ... so were the tires. On day seven, as we headed down Interstate 90, south of Madison, Wisconsin, a driver came alongside, blowing his horn and pointing at our trailer. I pulled over on the narrow grass verge and we found a nearside tire shredded and hanging off the rim. Big trucks thundered past, shaking the trailer as we changed the tire. Finally at 2100 that night, after 620-miles, we stopped at a rundown anonymous motel in Indiana that was eerily reminiscent of the Bates Motel from Hitchcock’s Psycho. Even TripAdvisor warned us to “keep driving.” But we were exhausted. The second tire blow-out next day was 90 miles from Annapolis and journey’s end. We could smell the burning rubber and see the smoke in the rearview mirror. 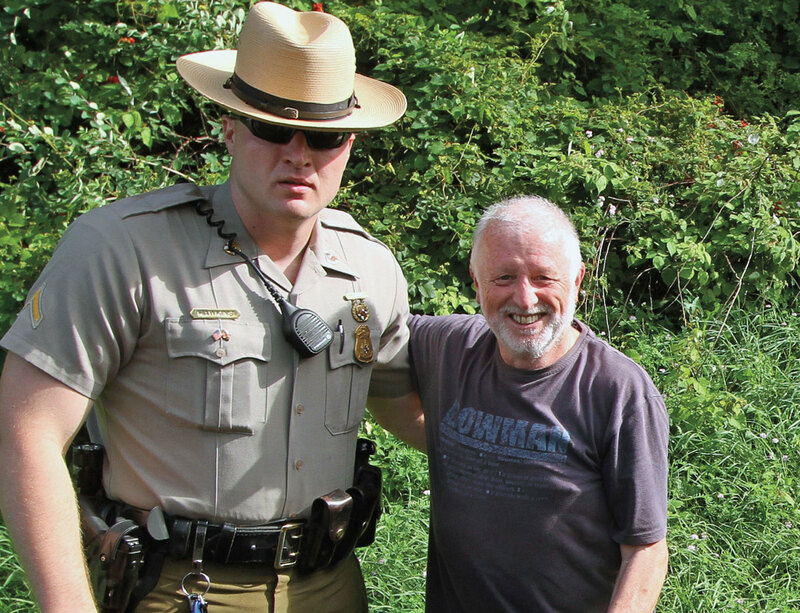 This time, a State Trooper showed up, but by now we knew the drill and had already changed the tire. 1. Adjust load to get the tongue weight up to 10 percent of the boat and trailer weight (6,000lbs in our case). 2. Add load equalizer and sway control between ball hitch and trailer to lift the back end of the car and prevent fish tailing. 3. Keep heavy objects off the back ofthe boat. 4. Use a two-axle trailer with springs and compensator to keep all wheels equally loaded to the ground. 5. Pump additional grease into bearings with wheels jacked up and spinning until grease comes out the front so grease totally fills around bearings. 6. Use correctly rated tires and air pressures. Check frequently. 7. Make sure you have disc brakes on all wheels. 8. Surge breaks, check fluid frequently. 9. Secure load so that in the event of an accident things do not separate. 10. Secure mast and rigging so that they do not rub against the cabin. 11. After driving 25 miles or so, check the temperature of the disc brakes and bearings. 12. Re-tighten wheel lug nuts and check them frequently. 13. Check for damage as a result of vibration on such things as mud guards. 15. Carry four spare wheels, lug nuts, brake pads, brake fluid and grease.